Normally we’d spurn Destiny’s Xur because he brings a whole bunch of nothing most times and honestly, if this were Year One, this week would be no different. However, with the recent Year Two variants of classic Exotics being in circulation, there’s plenty of reason to celebrate. Head to the Tower – Xur is in the corridor to the Vanguard where he will remain till 2 AM PST on December 13th. This week, Xur is carrying Year Two versions of Radiant Dance Machines (Hunter boots) and Nothing Manacles (Warlock gloves). The former isn’t too great but grants increased agility which combines with MIDA Multi-Tool for some serious pain. 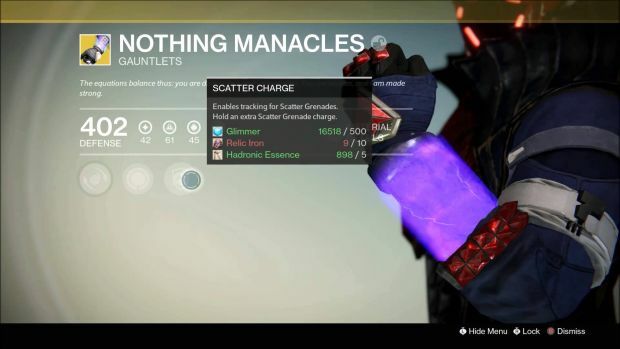 The latter lends tracking to your Scatter grenades and grants an extra Scatter charge on top of that – it’s viable in both PvP and PvE even if Bungie nerfed the tracking slightly. Each is available for 13 Strange Coins. Sorry Titans, but you get Helm of Inmost Light this week for 13 Strange Coins. At least the Monte Carlo is also available and for 23 Strange Coins. You can also purchase a Legacy Primary engram for 31 Strange Coins though we hardly see the point.